There’s been umpteen fitness games appearing on all home console formats lately, although as Nintendo were by far the first to delve into motion control with the Wii, their flagship console has been around a lot longer and therefore has received a lot more in the way of fitness titles. 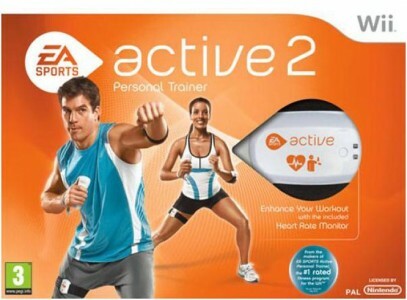 It’s a genre that didn’t really exist before the Wii as it was all too gimmicky and each game would have required a new set of peripherals, but now, with this latest offering EA are looking to take the fitness genre a step further, calling their game not just a fitness game, but a ‘Personal Trainer’. It certainly looks the part, it’s undeniable, with a Heart Rate Monitor that straps onto your arm, a Wireless Motion Tracker which straps onto your leg to detect movement in you legs on top of your arms already being tracked through the Wii Remote, a plug-in USB receiver to allow for this new equipment to link up with your Wii, and finally, most impressively, the game comes with a Resistance Band. There is even the option of making use of the Wii Balance Board if you have one, which will unlock specific extra exercises relating to this piece of hardware. Where all other fitness games thus far have used only the weight and movement of your own body to help get you fit, EA Sports Active 2 provides an element of resistance which considerably ups the intensity and variety of your workout. Although it may be hard to imagine yourself getting a good workout by standing in front of your television and moving around, there’s a remarkable intensity to the range of exercises on offer. There is a huge variety of exercises crammed onto the disc, giving a mixture of frantic activity and endurance challenges, also not forgetting that exercise should be fun too with a pinch of mini-game style sports-based exercises added in for good measure. The sports-based challenges give activities based on popular sports such as football heading and shooting hoops in basketball and add a sweet side-order of light hearted fun to go with the tough physical exertion of the other exercises. The game kicks off with you selecting your mentor and designing your fitness character. The latter is a bit of a gimmick, so although there is a lot of different clothing to sift through, it is up to you whether you make your on screen counterpart look life-like or not. You have a choice between two different mentors, Devon, a strength and conditioning coach who knows that “staying fit is a balance between hard work and fun”, or Niki, a fitness coach specialising in nutrition and aerobics who tries to work on your discipline, motivation and focus. Ultimately, who you choose from the start doesn’t have a massive impact on the game that follows and can always be changed later, but it decides who you will have yelling encouragement at you to help motivate you. It remains important that you pick someone you don’t mind listening to as a lot of the exercises come with a fair bit of instruction. Where EA Sports Active 2 stands out from its competitors is in the complex structure that surrounds the workouts. It’s all well and good providing a Heart Rate Monitor in the box to show you’re serious, but without making use of it then it’s just a novelty knowing how fast your heart is beating. The developers completely understand this, which is why they have offered up one of the most in-depth fitness tracking systems in a game to date. The Heart Rate Monitor constantly tracks your heart rate – even in the menus – meaning it can draw accurate data from your resting and working heart rates, and using this information to estimate the amount of calories that you are burning. All this data is then represented in in-game charts and graphs which help to visualise your progress. What’s more, the game even has a website dedicated to it which allows you to upload all your data and see a more detailed overview of your results on the PC, as well as playing host to a social networking system called Workout Groups which grants you the ability to compare fitness programs with other friends. It’s a very comprehensive fitness simulation that should be seen as more of a program than a game, and if the previous point about the detailed data-recording isn’t proof enough, then the sheer wealth of certified exercises should be enough to sway you. It lays out a fitness program over a week, including rest days as is crucial for exercise of this level, so each of your exercise days you are asked to check in and do the laid out fitness regime. The game gives you a set of default goals to reach that can then be edited to suit your personal targets. The workouts can also be edited with the option to check and uncheck certain exercises depending on your likes and dislikes, adding or removing them from the timetable accordingly. To make the game a complete health package, it features a lifestyle & nutrition survey too, the results of which are reflected on through advice aimed to further improve your fitness. Being healthy is not just down to the exercise – your lifestyle and diet is a large factor as well. Overall, EA Sports Active 2 has to be one of the most complete fitness games ever released, with the peripherals included indicative of this. While the Heart Rate Monitor and additional leg strap sensor may seem excessive, the impressive data recording somewhat justifies their inclusion, as does the game’s in-depth website. There’s a blend of gruelling physical workouts and fun sports challenges to have you exercising, but also getting some enjoyment out of it too. The exercises are in full supply with an expansive list of different sets and reps to choose from – all to a surreal desert holiday-resort backdrop. It only loses marks because the peripherals take the price up a peg, and when you factor in costs for a Balance Board if you want to get absolutely everything out of the game, then it soon becomes a beefy investment.